Using the existing screen for the ‘Call’ tab in the Hiya iOS app and mockup a proposal for a more visually appealing design using the existing content and features. Assess user experience data gathered by Hiya to find out what the failing points of the dial screen on the app are. Research both iOS and Android user interfaces to see what dial pads are used in the operating system. The reason being I want the dial pad design to be functionally familiar and easy to use (no learning curve). Look at competitor apps and see how their interface is designed/functionality/etc. Are they easier to use, or harder? What are their failing or succeeding points in comparison to Hiya's app? What should the information architecture on the page be? What is the most important, and what needs to be emphasized or deemphasized? My main reference for information was Hiya's current iOS app design and the user research they had done, which concluded that most people were confused about how to look up phone numbers from the dial pad screen, or they were unsure what the functionality was for. What data is important in making the functionality of the dial screen successful? The current design is not intuitive. Most people are not sure why this screen exists and use the Identify tab to look up phone numbers instead. Most users are not aware that they can look up their phone contacts in the app and call them back. What are Hiya's competitor apps doing? Is their interface easier to use, or harder to use? What are their failing and succeeding points? What are the visual strengths and weakness of the current Hiya design, and is there any way I can make the current design better by saving space on the screen, or reorganizing the structure of the dial screen? I also research both iOS and Android user interfaces before I begin sketching to see what dial pads are used in the operating system. The reason being that I want the dial pad design to be functionally familiar and easy to use (no learning curve). Taking the user experience data Hiya gave me and my own research into account, I now have a high-level idea of what needs the design needs to accomplish in order to meet the needs of the user as well improve the architecture/design of the dial screen. Utilize space more efficiently by making the contacts bar run horizontally as opposed to vertically. This will allow me more real estate to be able to add contact images, names, and details to the contacts. Change the tab menu to a hamburger menu to save more space and to also allow for future additional pages to be added without affecting the dial screen design. 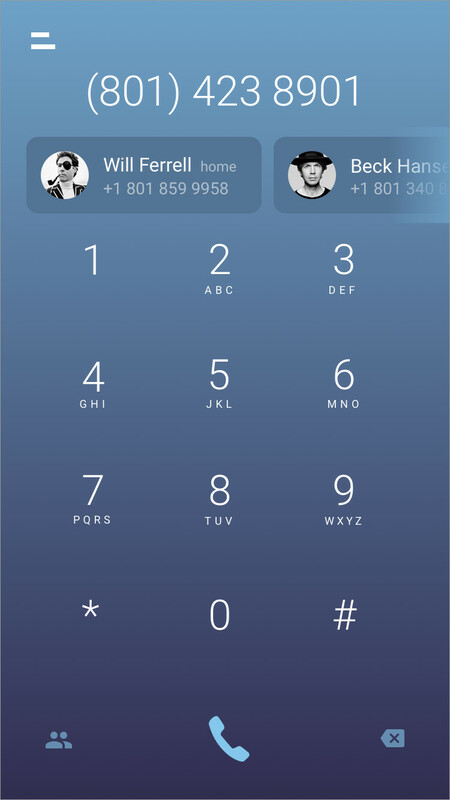 Make the dial pad stand out and be more visually appealing than it currently is. During this phase I sketched out concepts on paper, getting through a lot of ideas fairly quickly...what worked and what wouldn't work, while still keeping in mind the user feedback I received above as well as my own personal research. At this point I was only thinking about structure and the best way to display functionality. 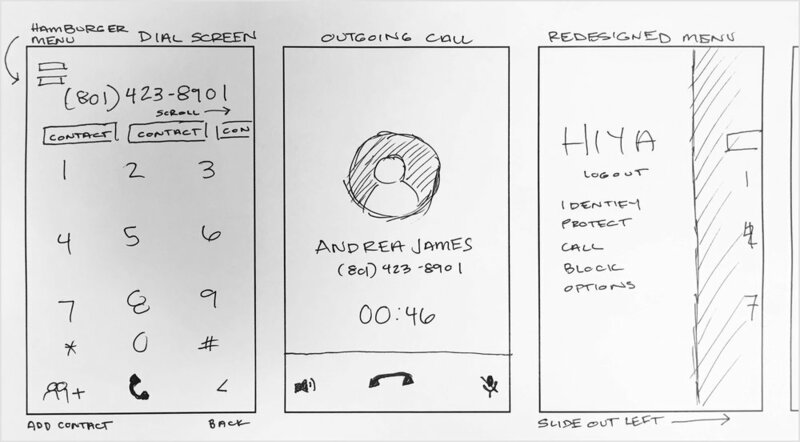 Sketch concepts for HIYA app dial screen redesign. After creating my initial sketches, I picked the strongest screens I'd drawn and using Sketch turned them into lo-fi wireframes. Again, the point of this was mostly just to block out areas of information and hierarchy. Now that I have my basic wireframes created, I move on to creating a high-fidelity prototype. At this stage I pick a color palette, user photos, and flesh out the entire design using my wireframes as a guide. I also created an alternate version of the dial screen with the user's home or cell phone listed next to their name in the event that the contact has two numbers (home and cell). The client was happy with initial design. They gave me some additional clarification as to how the dial pad screen was currently functioning after the initial design was presented that would warrant a few tweaks to the screen I'd created. Overall Hiya were very happy with my visual design and direction, there were just a few tweaks that needed to account for different functionality that I wasn't aware of in the initial brief. Ideally I would like to look at the overall architecture of the entire Hiya iOS app and reassess what needs to be there. I think there is some functionality that could be questioned, such as: is the need for a dial pad necessary, or is it just confusing users? Would it make more sense to add all the functionality to the Identify page and nix the dial page altogether? Of course this was more of a high-level look at the app, and so while I'm happy with my design, I know I am somewhat limited to the brief I was given. In future meetings, I would want to bring up harder questions about the overall structure of the app.